What does that mean for Washington State? Rumors are flying about the Motorcycle Safety Foundation (MSF) stepping away from the California Motorcyclist Safety Program (CMSP). What's going on? In California, the California Highway Patrol (CHP) is the state agency responsible for motorcycle safety. For the past ten years or so, CHP have contracted with the MSF to administer rider training as well as supply curricula and training materials. During 2014, the California Highway Patrol (CHP) revised their policies on rider training. It may be that increases in the CA fatality rate caused CHP to re-evaluate how new motorcyclists are introduced to the sport. Under MSF's leadership, the fatality rate increased 63%. Nationwide, our motorcyclist fatality rate is almost triple that in Europe. In any case, the MSF declined to submit a bid to CHP, and also denied permission for anyone to use any MSF curricula in California. The bid for administration of the CMSP for 2015 was awarded to Total Control Training, managed by Lee Parks. The novice curriculum will be the "Total Control Beginner Riding Clinic", which is actually a modified version of the Idaho STAR Motorcycle Safety Program's Basic I course. 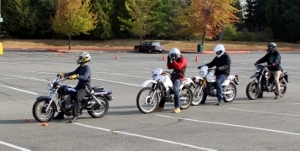 The Idaho course is a modified version of the Basic Rider Training (BRT) course developed by the TEAM Oregon motorcycle safety program. When the National Highway Transportation Safety Administration (NHTSA) reviewed motorcycle safety programs nationwide several years ago, the BRT in both Idaho and Oregon was rated highly. Retraining 600 or so California instructors and converting more than 100 training ranges to the TCBRC is a tough challenge that needs to be accomplished in a very short time frame. To help, Total Control Training will bring on board Ax Axmaker, current Program Director of the Idaho STAR program. The management switch from MSF to Total Control Training is especially noteworthy because when TEAM Oregon decided to write their own independent beginner course in the mid-1990s, they were sued by MSF for theft of "intellectual property." Apparently this wasn't just to whip Oregon back into line, but to send a message to other states to not mess with the MSF. The lawsuit was eventually settled out of court, but other states were temporarily intimidated. The situation made it clear that the "safety" arm of the motorcycle industry wanted to squelch all competition. The irony is that the very course they intended to stop is now superseding the MSF's course in California. Since California has historically been home to approximately one-third of the nation's motorcyclists, trends started on the west coast have often spread to other states. So, it's very likely that other states will begin to rethink how novice riders are trained, and start looking for alternatives to MSF curricula. Washington has already studied the BRT as a replacement for the MSF's "Basic RiderCourse". While there are no plans to move to it in the near future, as the national landscape changes, so may Washington. You might be wondering, "What's wrong with the MSF's BRC?" It's easy to teach, it's cheap, it's fun for newbie riders, it's only two days, and it typically leads to a license. What's wrong is that easy, cheap, fun and fast "training" is putting too many riders on the road without the necessary skills and knowledge to survive traffic. Too many of them are becoming fatalities. Maybe that's what CHP figured out?